I was asked to help a Sister use Prezi software and thought I’d have a bit of a play with it to see how it works. I will share the result with a sympathetic audience. A more professional version might be a good way to promote our collections. 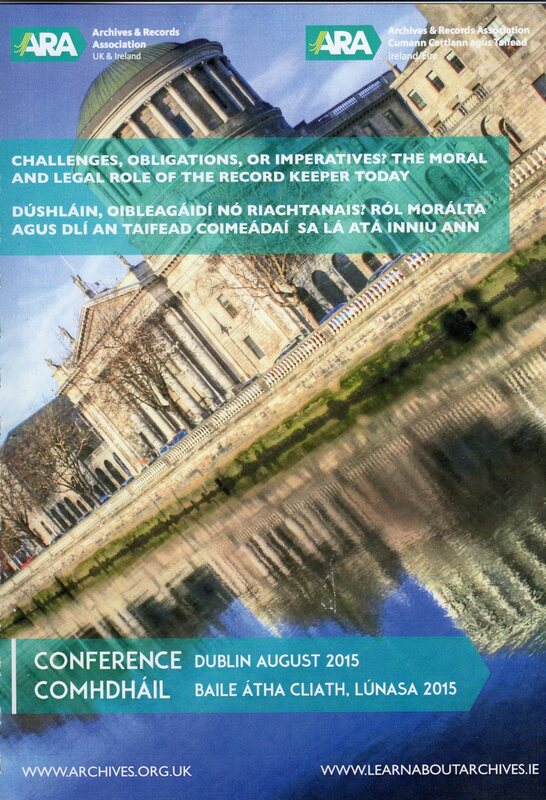 The Annual Archives & Records Association (ARA) UK & Ireland conference arrived in Dublin last week, to explore various ethical and moral dilemmas facing the record keeping profession. After the opening keynote address, simultaneous sessions ran on the themes of Archives & Records, Conservation and Digital Preservation. As the three streams ran simultaneously, it involved some hasty note gathering and a dash to attend the next input. The key note address by James King explored the Boston College Belfast Project, where after some legal wrangling, access to ‘sealed’ oral archive recordings with participants in ‘the Troubles’ was successfully granted to authorities. The influence exerted by stakeholders and the role of the archivist in facilitating justice was explored. Poor record keeping practices identified by various inquiries into past abuses in state and church institutions in Ireland, the UK & Australia and the management of medical (mental health) records in Ireland, provided the background to a number of talks, which probed our traditional concepts of access to and ownership of records. There are ever growing demands from care leavers – the subjects of these records – for open access to and, indeed, ownership of records containing their personal information. We were challenged as a profession to advocate for good record keeping practices on the basis that the personal and social consequences of the failure to do so, are now accepted and well documented. The Public Records (Scotland) Act 2011, drafted as a result of recommendations from an inquiry into historical abuse, was widely praised. The difficulties facing the practitioner working in the private sector, who is responsible for managing and preserving records without the framework of ‘enabling legislation’ were acknowledged. The various inputs prompted me to consider the ‘official’ records of individual Sisters & those whom Loreto work for and amongst. They seldom had any input or control over the creation of records relating to them. As Loreto archivists we have an obligation to honour the unique contribution & life of each Sister, but also all those – the empowered and the disenfranchised – whom Loreto worked and continue to work & live alongside. We, as Loreto archivists, are accountable not just to the Loreto Sisters, who are our primary stakeholders, but also to the wider communities which they serve. I hope that the Loreto Archives Policy will provide us with an enabling structure to work towards the fulfilment of the duties and responsibilities of our roles, and our moral and ethical obligations to all our stakeholders. I would like to share a little of my recent trip to Hobart and the annual Australian Society of Archivists’ Conference. Firstly, Hobart was not cold at all! Well, maybe that was compared to Ballarat. But the surprise fine sunny Hobart weather was an added bonus to the conference. The theme of the conference, ‘Archives on the Edge’, referred to the geographical location of the conference, of course, but also to the idea that archives are at the precipice of the Information Revolution. There were interesting discussions, initiated by Keynote Speaker Geoffrey Yeo, as to the professional role of the archivist in our information age and how we could continue to be a vital part of the hub around which greater and greater amounts of information dizzily circles ourselves as individuals and our organisations. Information, which comes our way as disorganised white noise, must be tamed to be a useful resource by the active process of record keeping and records management and the consequent keeping of archives. Archives are then available, with human intervention and interpretation, as a source of knowledge and thence art, philosophy, science; the fundamentals of culture. There were practical examples of how archives are being used to secure and revitalise cultural identity. Fascinating work is being done on Tasmania’s convict records by Hamish Maxwell-Stewart of the University of Tasmania. Tasmania was a prison without walls as the walls were on paper. Only a small percentage of Tasmanian convicts were ever incarcerated in physical prisons, the others being assigned to work for private individuals or government projects. Consequently their lives were controlled by the administration and hence they became the most documented people in the British Empire; we have records of their physical descriptions and photos, down to scars and tattoos, family background, bank accounts, medical records, run-ins with the law, of course, and locations and movements. Work is also being done in Tasmania on records of the Tasmanian aborigines. Julie Gough, artist and curator, whose matriarchal Aboriginal family line traditionally comes from Tebrikunna in far north eastern Tasmania, is piecing together aboriginal identities and culture through the records and artworks of colonists’ direct contact with aboriginal people, making genealogical connections and mapping locations and relationships. She then uses this knowledge to develop interpretative art works. Who can visit Hobart these days without taking the ferry to MONA (Museum of Old and New Art)? Here I spent a day being delighted by intensity of architecture and ideas. 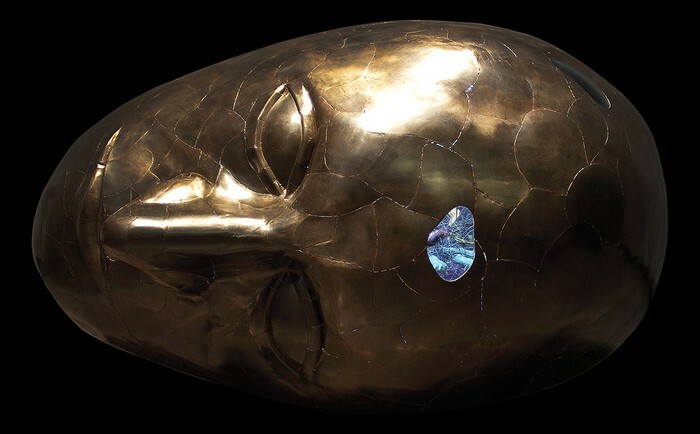 My favourite piece was ‘Artifact’ by Gregory Barsamian, which was a giant head filled with bizarre animated images. The artist says that, ”We get twenty million bits of information impinging on our senses every second, yet our conscious mind only interprets fifteen to twenty bits per second.” This seemed to support the message of the conference and the issues of the Information Age and, of course, archives’ place in it. It is the role of archives to help make sense of this information overload. 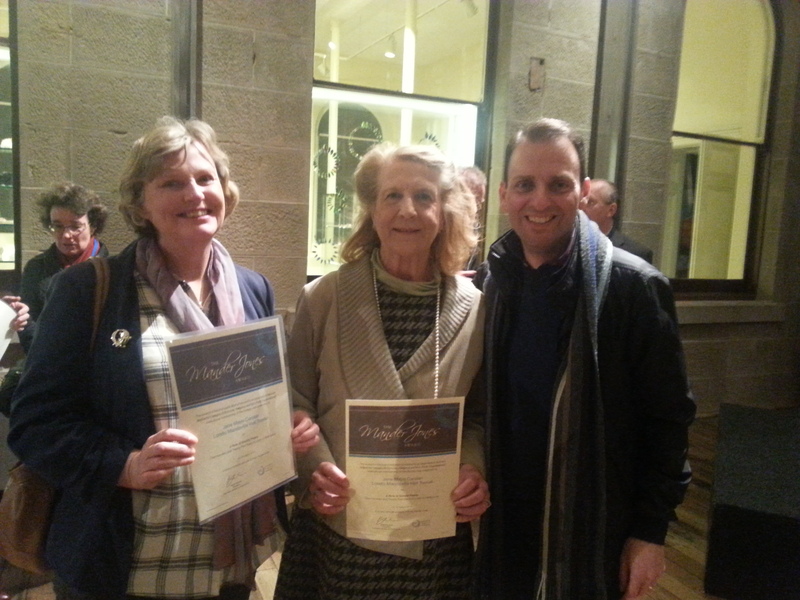 Myself, Jane Mayo Carolan, Steve Stefanopoulos.